If you are on a self-drive boat or cruising on you own barge, whilst you are in Pont-de-Pany, moor-up above lock 40 and take a bicycle ride the few miles to the village of Malain. 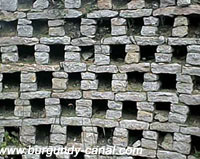 The gallo-roman ruins are fascinating, you can walk along and through this archaeological excavation site. 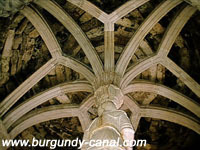 You'll see the bronze foundries, shops, foundations, cobbled streets columns and much more. Set on top of the hill above the village, is the impressive ruined chateau. 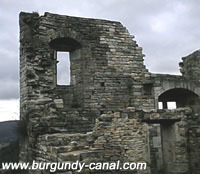 The first parts of the chateau of the "Lords of Malain" date from 950 A.D. You can walk up to the ruins and see the impressive restoration work achieved by the local villagers. 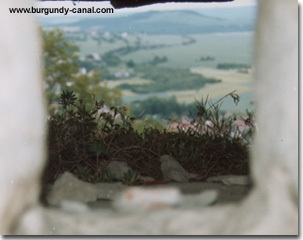 Looking through a canon hole in the wall of the ruins chateau of Malain south towards the River Ouche valley. 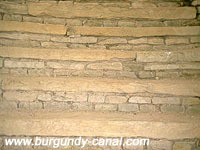 The stair case coming out of the dungeon. Remains of the pigeon house at the bottom of the castle hill. Arthurian landscapes during the winter. 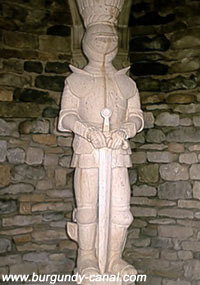 A master sculpture gives life to stone with this impressive knight, who awaits you at the top of a stone staircase. 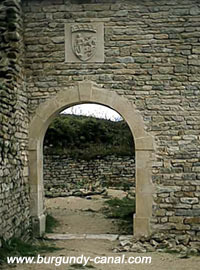 Cistercian influence is evident with these arches. 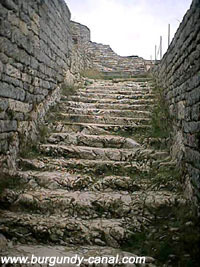 In the gallo-roman ruins, this stair case leads into a temple. 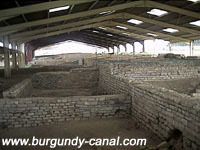 A view of the Gallo-Roman ruins, protected by a roof and is Burgundy's own version of Pompeii. The Festival of Witches, which held every two years is a fun event celebrating lost legends of events which occurred in the village.